Small batch Bourbon oozing a fully rounded character. Jim Beam is a global powerhouse in the world of Bourbon but their Signature range is completely different. It allows their 7th generation master distiller to experiment with different inputs and maturation techniques and is only available in small batches. The product itself is all about self expression. Having been matured for 12 years, which is longer than the main Jim Beam range, this Whisky has a more complex character emphasised by the oak casks it has been resting. Yet it is smooth and well rounded. A Bourbon both to savour and devour. 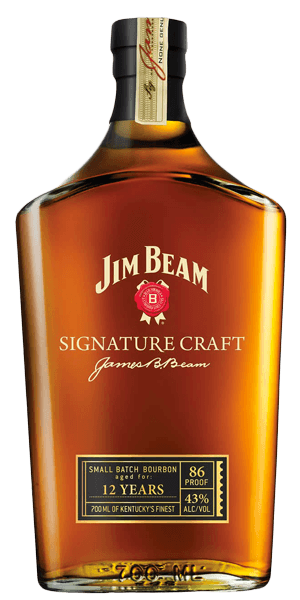 What does Jim Beam Signature Craft 12 YO taste like? The Flavor Spiral™ shows the most common flavors that you'll taste in Jim Beam Signature Craft 12 YO and gives you a chance to have a taste of it before actually tasting it. Oak still present, strong spices. Tried it because of the price. Turned out to be one of the smoothest, nicely flavored Bourbons we tried. I can't get it in Idaho anymore. Sad day. Really liked this. Warm and smooth with caramel, oak and hints of vanilla. One of the better bourbons I’ve had from the Beam family. Surprisingly smooth & robust flavors. Now the problem is finding more. Is a good smooth bourbon!